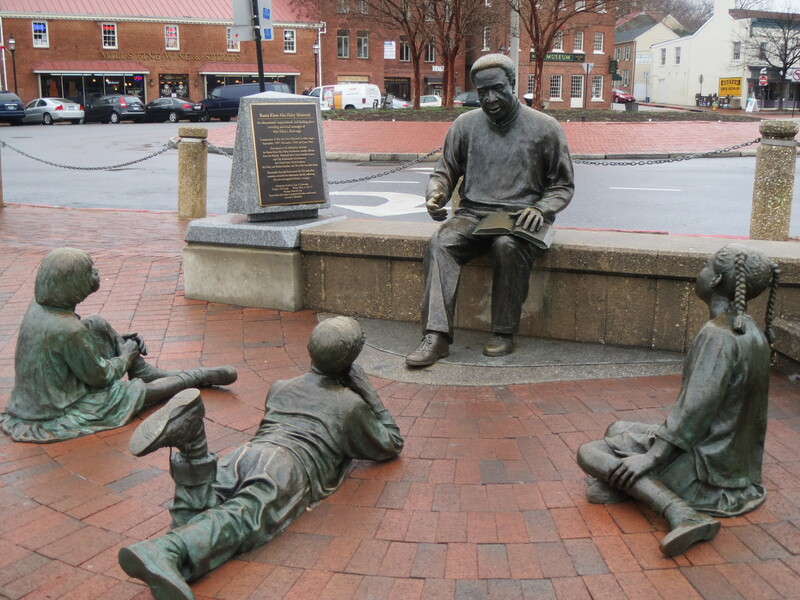 An image of the Kunta Kinte Alex Haley Memorial in Annapolis. I vowed when I went to college that I was not going to watch any television because I was a TV addict. So there are lots of TV series that started during those years that I never watched, but I broke my vow when Roots was broadcast in 1977. It was a television event. Almost all the households in the nation were tuned into the series which was based on the book of the same name by Alex Haley. I vaguely remember lots of young women huddled around the TV in the dorm lounge. The series was the topic of lots of discussions in classrooms, the student union, and the commons at meal times. We needed that discussion then, and we need it now. It’s hard to talk about how deeply I was affected by that series. My heart was wrenched and broken during many of the episodes. I didn’t understand how whites could think it was okay to enslave blacks and treat them with such cruelty. And yet, through the seven generations of Kunte Kinte’s descendant’s story, there was hope, perseverance, and dignity in the face of the most horrific situations. One of the things I got out of both the book and the series was that freedom is a state of mind. Many of the characters in Haley’s story discover this. They pass this down through the generations of their family and in the end they are able to prosper. I loved the series so much that I bought and read the 729 page paperback version of the book. Reading it was at times harder than watching the series because of the descriptions, especially the sections on the ship. How anyone could survive the lack of food, clean water, the filth and laying packed so tightly one prisoner to another in the hold with very little fresh air and exercise, comes down to the human will to survive. But the book is about human tragedy. It shows not only how slavery affected the slaves, but their masters too. The masters were not exempt from the tragedy of slavery because the book shows how their humanity was eroded as they ignored the worth of those they were torturing and enslaving. Slavery and the way we continue to treat blacks, and people of ethnic groups other than white, is something we need to acknowledge and examine not once, but over and over again until we learn that every human being is worth being treated with dignity and respect. The 1977 version of the Roots series was one point in history when we faced a wound in our county’s history that needed to be healed. But after the hubbub died down, we forgot and went back to our comfortable corners. I was happy that another version of the series was produced in 2016 for a new generation and the self-examination started all over again. Even though both series were great and generated lots of viewers and discussion, I think reading the book is a must. The way Alex Haley wrote it put me into the minds of the characters, particularly the black characters, and made me feel what they were experiencing. A book that can do that, changes the perspective of the reader. It certainly did mine. Years later I was teaching special ed. English, and I decided to read Roots to the students near the end of the school year. I wept again as I read the chapters that took place on the passage to America. The students were just as affected as I, and some even wept with me. That confirmed my conviction that anything that can help us see the world from someone else’s point of view is good. If you haven’t read Roots, or seen either of the series, I suggest you do, because we’re at another one of those seminal moments in our country’s history, when we need to take a step back to do more self-examination and healing.